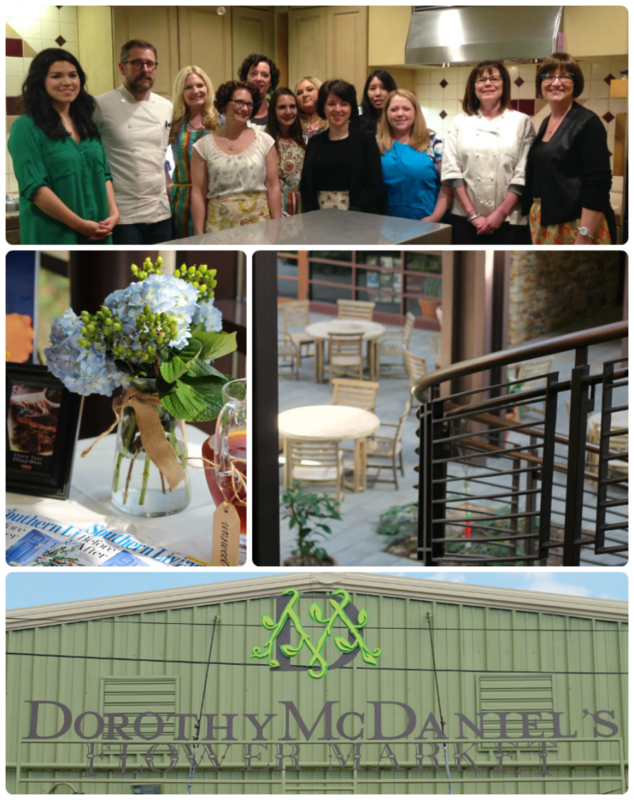 Some of you all may remember the little trip to Birmingham, Alabama I took back in March to tour the Southern Living headquarters and to indulge in some delicious authentic southern food. 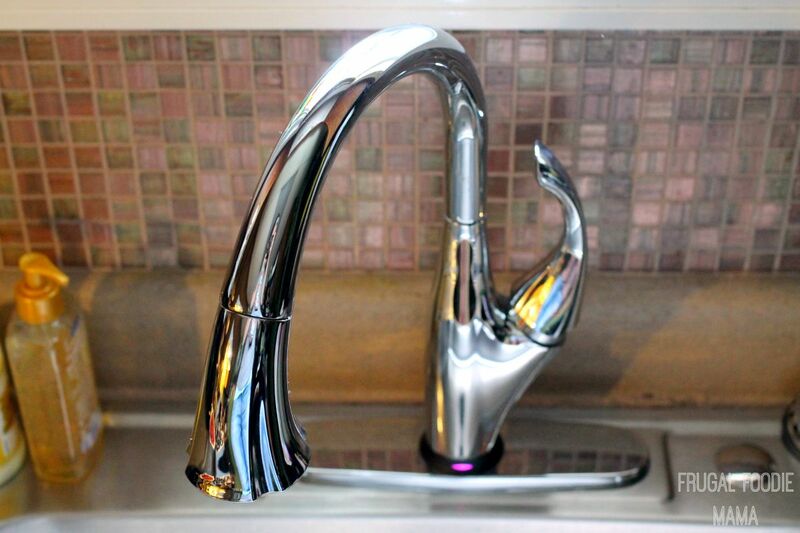 That quick southern getaway happened to be sponsored by the good folks at Delta Faucet. Whisk together the flour, vanilla wafer crumbs, yeast, sugar and salt in a large bowl. Add the very warm water and butter. Mix until well blended, about 1 minute. Gradually add enough remaining flour to make a soft dough. Dough should form a ball and will be slightly sticky. Knead on a floured surface, adding additional flour if necessary, until smooth and elastic, about 4 minutes. Roll dough on a floured surface to a 12-inch circle & then place in a greased pizza pan or cast iron skillet. Bake for 12-15 minutes or until the crust is slightly golden brown. Allow the crust to cool completely on a wire rack. 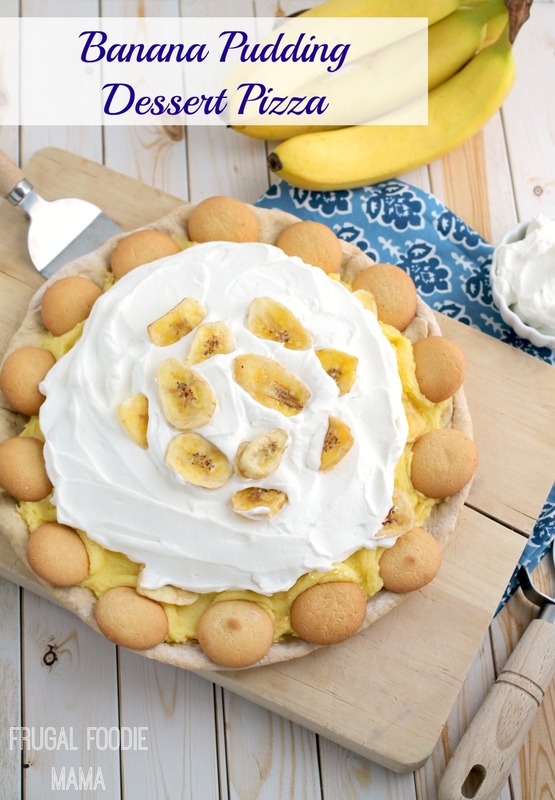 While the crust is baking, prepare the banana pudding frosting topping. Whisk together the pudding mix and milk in a small bowl. Set aside in the fridge until thickened, about 3 minutes. Meanwhile beat the butter in a large mixing bowl with a hand mixer until light and creamy. Add in the vanilla & thickened pudding. Blend until smooth and creamy. Add in the powdered sugar & blend again. 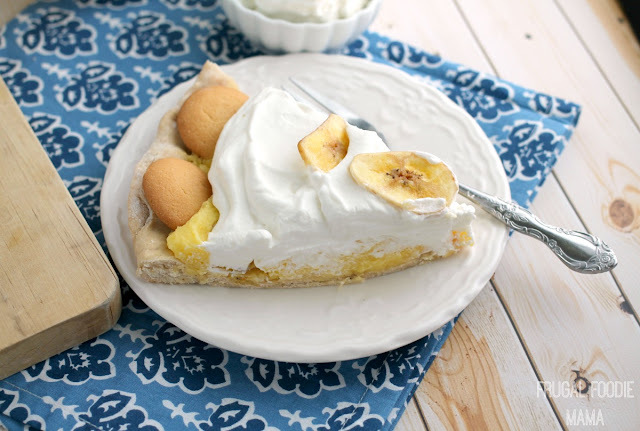 Once the crust has cooled, evenly spread the banana pudding frosting over the crust. 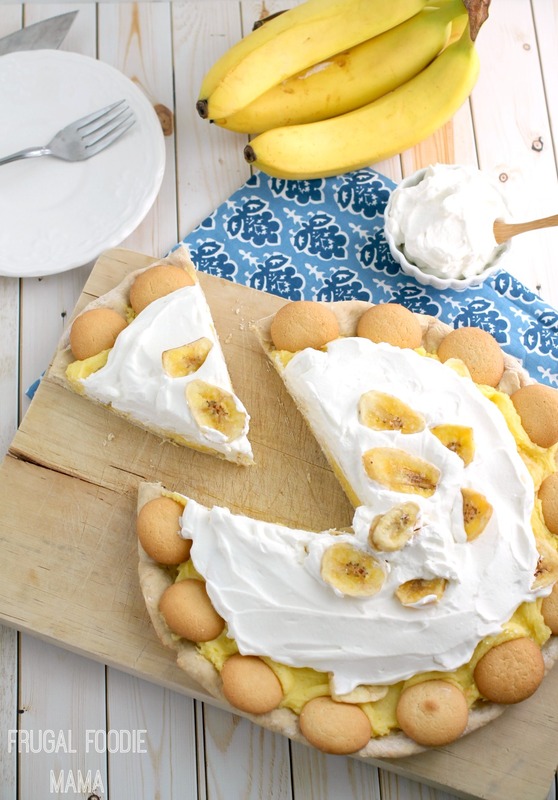 Press banana chips into the pudding frosting topping. Right before serving, prepare the whipped cream. Freeze the bowl and beaters in the freezer for 10-15 minutes before preparing the whipped cream. Pour the cold heavy cream, sugar, and vanilla into the chilled bowl. Beat with the chilled beaters until the mixture is thickened, creamy, and medium peaks form. Spread the fresh whipped cream over the center of the banana pudding topped pizza. 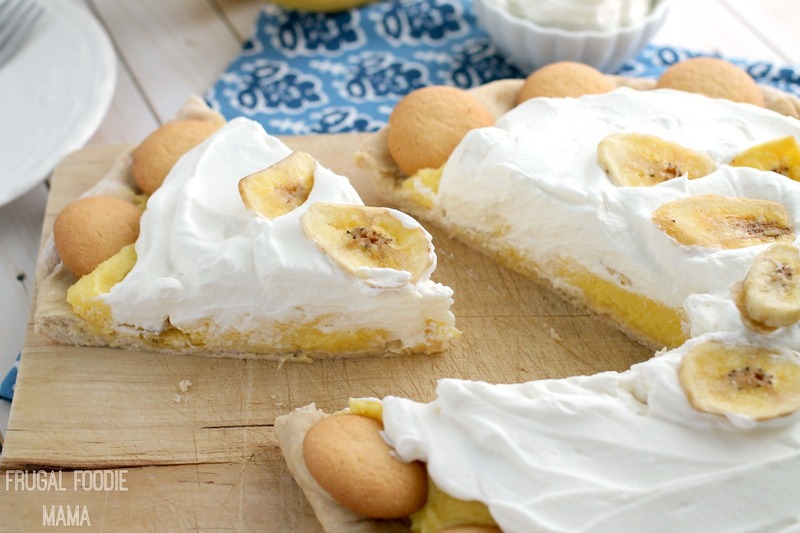 Garnish the whipped cream with more banana chips. Press whole vanilla wafers all along the outside edge of the crust. Slice and serve immediately, or wrap and keep refrigerated until ready to serve. You can store any leftovers in the fridge for up to 3 days. 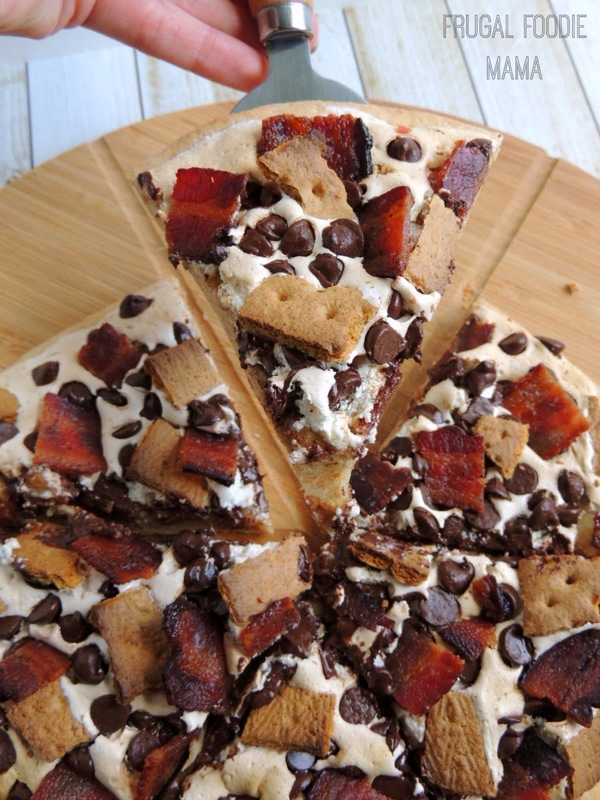 Now I did use dried banana chips for this dessert pizza instead of fresh banana slices, but you can feel free to use fresh if you expect the whole thing to be gobbled up the day that you make it. I decided to use banana chips because I knew it would be in my fridge for a couple of days, and I am not a fan of brown, mushy banana slices.